After a launch on iOS and Android mobile devices, young studio Gentlebros Games – love the name – decided to bring Cat Quest to consoles, starting with the Nintendo Switch. A game that has a key art showcasing a bunch of toon cats wearing medieval and fantasy costume got me extremely intrigued, and so I managed to get a review code from the developers to give you all my input on this fun isometric view Action RPG. The story of Cat Quest takes us to the lands of Felingard, as you are on the lookout for your sister, kidnapped by the dark Drakoth. The crime occurred in the middle of a stormy sea trip, and our young hero got branded with the mark of dragon hunters, thus the only hope to save the world from Drakoth and his Dragons. It’s your typical fantasy setting, expect full of cats and feline puns everywhere, whether it is the name of the cities (the Catpital for example), or even the spells known as Lightnyan, Flamepurr, and Healpaw. You reach this small world of Felingard opens after the opening credits that explains the premise of the story. Tossed directly into the heart of the action, our little furry hero will start to learn combat skills, master magical spells, fight monsters, and meet NPCs and key places that will help you regain health, save or even buy weapons and armor. Because yes, as adorable as this game looks, it’s actually a sort of Action-RPG. In addition to the storyline filled with main quest, there are billboards in all the little villages and cities you’ll cross path with, offering us a bunch of sidequests, full of fun story and witty humor. Add to that in between a bunch of regions to explore, dungeons to explore, and you have plenty to do in this rather small packaged game (I estimate around 10-12 hours to complete the game at 100%). Gameplay wise though, you are dealing with the very basic here, as this game was primarily designed for mobile gaming first, but still well thought out and intuitive. At each level, your character’s stats go up nicely, while the variety of our equipment allows us to play different play styles, whether you want to be faster but light on armor, or tanky but slow to attack. Now don’t expect anything as complex as The Witcher 3, but the title still manages to have variety of gameplay options, including spells, which have even their own combos. The universe of Felingard is really large for such a small-sized game, really rich in colors, with original designs, almost as if you are walking on what looks like a paper map or a decor of one of those interactive books for children. There are a lot of areas to visit, but my main issue on that front is that I wish there was more variety in the vistas and designs. At least, Cat Quests is free of bugs, lag or any sort of technical issues which is great for a change. As you most probably understand now, Cat Quest is not a pearl of realism, or an ultra violent and barbaric RPG. You are dealing with a game that is truly inspired by old RPGs of the early 1990s, with an accessible gameplay that appeals to all ages, but also a serious and challenging game. Plus, I can’t help it… I’m biased toward cat-themed games. 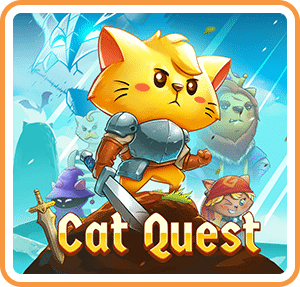 Cat Quest was reviewed using a Nintendo Switch downloadable code of the game provided by PQube. The game is also available on PC, Xbox One, PlayStation 4, iOS and Android devices via digital release. We don’t discuss review scores with publishers or developers prior to the review being published. Cat Quest is a little game inspired by the Legend of Zelda, full of furry adorable creatures and witty humor. For its little price, I would jump in and not judge the book by its cover, as this Action-RPG has more quality content than some of the biggest AAA releases nowadays.